For those that don't have a home wireless network, streaming audio from a computer or MP3 player presents a daunting task. No one really wants to run hard wires from an office computer to a living room home entertainment system and setting up a wireless network just for music may be more trouble than it's worth. Aperion Home Audio Link provides an easier alternative for streaming needs. 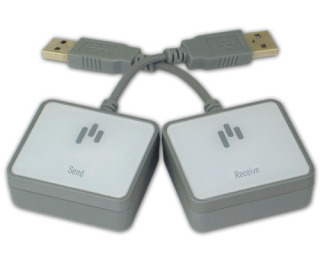 The two-part system features a receiver and transmitter and doesn't require any software. Simply plug the transmitter into your computer's USB drive or device's audio output, connect the receiver to your stereo and enjoy your whole digital music collection on your home audio system without any further effort or complications. The Home Audio Link streams uncompressed music up to 100 feet over the 2.4 GHz frequency band. The initial receiver/transmitter combo will run $149 and you can add additional receivers for $70, enabling you to enjoy music in up to three rooms in the house. According to Aperion, the system works through most walls and ceilings, so it should serve to wire your house for music. The Home Audio Link can also be used to make your powered speakers or subwoofer wireless, by connecting the transmitter to the stereo receiver output and Aperion receiver to the speaker. The system will ship on January 28. Overall, it looks like a handy, streamlined way of enjoying music around the home.